Everyone knows I'm going to be a crazy bride. I have been engaged 25 days and our venue/caterer, photographer, and photobooth are already booked- deposits have been sent. I know it's a little bananas and I still have a glorious 13 months to plan every last detail, but there is one thing I've learned in this process so far- OTHER BRIDES ARE CRAZIER. Everything I've booked has been in a sense of urgency for fear that we won't get what we want if we wait too long. Take the venue, for instance. I e-mailed just to get some info on the general time frame Steve and I were looking at, only to find out that half of September and all of October 2012 were already taken! Obviously, I had to jump on it. Steve and I will be getting married in Savannah, Georgia where we both went to college. We didn't know each other while we were in school, so it'll be fun to go back as a couple. Both of our families live on the East coast so we wanted somewhere easy for them to travel to and most of our friends are also SCAD alum so we thought it'd be a fun "destination" for them to visit again. 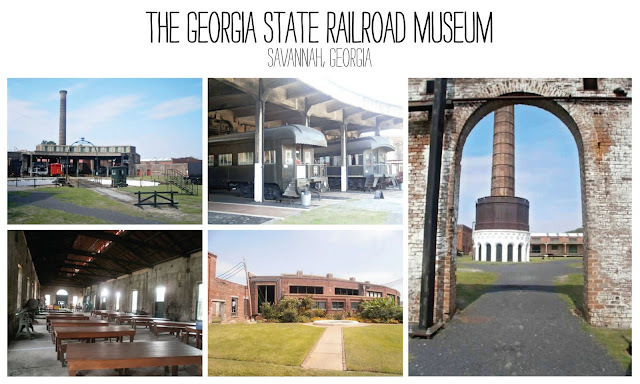 After exploring several different options in the beautiful historic city, we landed on The Georgia State Railroad Museum (formerly the Roundhouse Railroad Museum). The property is an old train yard and has tons of rustic character. We love that it's out of the ordinary and not too stuffy. After all, we want the wedding to be a GIANT PARTY. You can find other examples of a Steam Punk Wedding and a Vintage Wedding done there earlier this year. Both are amazing. The two of us will be going to Savannah next weekend to check it out for the first time and we're SO EXCITED. I am already going back to speak to SCAD's incoming Freshmen at Orientation, so this trip worked out perfectly. Stay tuned! Okay, okay... SO my maid of honor (that's right, maid of honor- we'll get to that later) has been giving me a hard time for not blogging and rightfully so. It has been a very, VERY long time since I've written a post, but that's because life has been a whirlwind of crazy amazing things! For starters, I switched jobs. I am now back with the Walt Disney Company doing Graphic Design for apparel and accessories at the Disney Store! I could not be happier to be back with my old team in my old office doing what I love to do on products I LOVE. That being said, I've also been way too busy with my new workload to post something everyday. So that's my excuse. Secondly, and most exciting, I AM ENGAGED!!!!! Steve proposed on August 4th and I was totally surprised. I have been fully immersed in helping to plan my Matron of Honor Kendall's wedding (that's right, besties engaged at the same time) that I didn't even suspect anything Steve had in the works. He came home with Chinese food one night after work and sitting in my box of potstickers was a beautiful sparkling ring! What? You want to see it? Well here you go! I PROMISE I will try to be better about posts. Lots of exciting things to come!